Okay, it’s pretty darn amazing that your iPhone can tell you precisely where you are and precisely how to get somewhere else. However, in most cities it’s the getting somewhere else part that’s the problem. Why? One word: traffic. The Maps app might tell you the trip should take 10 minutes, but that could easily turn into a half hour or more if you run into a traffic jam. That’s life in the big city, right? Maybe not. If you’re on a highway in a major city, the Maps app can most likely supply you with — wait for it — real-time traffic conditions! This is really an amazing tool that can help you avoid traffic messes and find alternative routes to your destination. 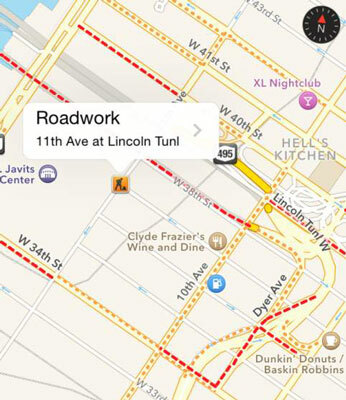 Maps can also show you traffic construction sites, and it gathers real-time information from Maps users to generate even more accurate traffic data. If you’re in the middle of turn-by-turn directions, Maps even recognizes an upcoming traffic delay and offers an alternative route around it! To see the traffic data, tap the lower right corner of the screen, and then tap Show Traffic. Maps displays an orange dotted line to indicate traffic slowdowns, a red dashed line to indicate very heavy traffic, and Roadwork icons to indicate traffic construction sites.